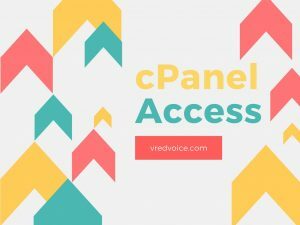 In this article let us see 3 options on how to access your cPanel of your website easily. For people who don’t know about cPanel, it is used to install and manage websites in hosting accounts. Most popular hosting providers like Godaddy, Bluehost or HostGator provide their users with cPanel when they buy a shared hosting account. Ok, now let’s get into the question on how to access the cPanel of your website. By default websites using cPanel will have a default URL to access the website. The URL will be in the format of example.com/cPanel (you need to replace the example.com with your website domain name). Another URL which you can use is cpanel.example.com (here also you should replace the domain example.com with your own website’s domain name). Account management panel is nothing but your hosting account where your website is hosted. For example if your website is hosted at HostGator then you need to login to your HostGator account. Once logged in search for an option called “manage your websites” or similar option. This option will be displayed in your products section. At times you will not be able to login to your cPanel even when you type-in the correct user name and password. That is you will be immediately logged out after logging into your cPanel account. In many cases this may be due to cookie issue, try clearing your cache and again log in. You might also get an error like “Your IP address has changed. Please login again”. This error might be caused due to you ISP’s (Internet service provider’s) frequent change in dynamic IP. Or, this might also occur when you have multiple login to your cPanel account. So, check and log out from cPanel account if it has been logged-in in any of your other devices. Login issues might also happen due to server issues. So if the issue persists contact your hosting provider immediately. This may also happen due to some trivial errors like wrong username or password. You must also double check the url to avoid logging in errors. Hence we have covered on how to access the cPanel in detail and also we saw what are the reasons for login errors. 1. Flush your DNS cache using ipconfig /flushdns in your command prompt. 2. Double check your username, password. 3. Check whether you have been blocked due to multiple login failures. 5. Clear your browser histories and cookies. 6. Check for multiple logins from any other device. 7. Try Changing the internet source, for example login with different Wi-Fi. 8. Login in incognito mode. 9. Check whether the url in address bar is right. 10. Contact your hosting provider. Hope you will be able to solve the problem by following the above steps. If you are still facing any issue, let us know in the comment section below.